Welcome to the English website of the Slovenian Vegan Society. Here you will find some basic information regarding our society, some eating tips for Slovenia, links to vegan related events and other useful links. If you are coming to Slovenia and need help, or have a question, an idea or a piece of advice, contact us at: info@vegan.si. The Slovenian Vegan Society is a non-political, humanitarian organisation of the civil society uniting vegans in Slovenia. It offers professional help and support to vegans and those who wish to become vegan, education about animal rights and animal care, ecology, and specialised nutrition education. Slovenian Vegan Society was established in September 2012 and has since been building a sound foundation. At the begining of 2017, there were 400 members, 7,500 people read our articles and announcements on our Facebook page daily and 3,000 people were subscribed to our monthly newsletter. In this short four years we have carried out a lot of projects, many of them on the regular basis. They have become a distinctive signs of our work. The most important ones are introduced in the paragraph below. Slovenian Vegan Society works together with many non-governmental organisations and celebrities. We also appear in the media: our events are well-known, they are published in the newspapers, online and occasional also on TV. Due to appearance in the media during the last three years, veganism in Slovenia has become more popular and accepted. Daily updated website (www.vegan.si) with 1,500 page views a day: up-to-date news and events, recipes, a collection of the most inexpensive animal friendly groceries in Slovenian supermarkets, a list of Slovenian vegan, vegetarian and vegan-friendly restaurants, coffee shops, stores, online stores etc. SVS’s stands: participating on other organisations’ events, representing vegan way of life and handing out our leaflets; a very important goal is having a stand in the centre of Ljubljana every Saturday. A SVS membership card: the card can be used for discount purchasing in our on-line store and in many Slovenian shops and restaurants. Issuing leaflets, brochures, posters, printed books and e-books about different aspects of veganism, e.g. animal rights, carnism, vegan nutrition and recipes, vivisection, environmental issues, vegan quotes (http://vegan.si/knjiznica). In Slovenia it's not difficult to find a restaurant with vegan options. There aren't many vegan-only restaurants but many regular restaurants would be able to prepare a vegan meal upon request. Below you can find a link to vegan-friendly restaurants and a vegan passport that helps you explain your eating habits to a waiter; vegan, education about animal rights and animal care, ecology, and specialised nutrition education. Almost every day there is a vegan-related event taking place in Slovenia. Some events are organized on a regular basis. Please find the list of regular events below, for all the others please check the following web page: www.vegan.si/dogodki/. 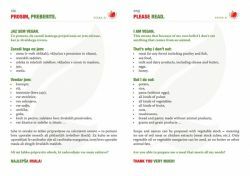 It is in the Slovenian language, so if you need any help, please do not hesitate to contact us by e-mail: info@vegan.si. We will be happy to assist you.